On this edition of Sepulchral Saturday we take a look at stoner doom and sludgy violence with the recently released Split between Quebec’s Dopethrone and Missouri’s Fister. Both bands have been relatively busy but Fister, in this year alone, have three splits counting this one. When it comes to perfect pairings to do this sort of release you can never go wrong with these two. Both are bombastically heavy in their own right and both worship at the slow and low altar. So let’s get Saturday off to a grinding good start and see what this pair has to offer. If you’re not familiar with Dopethrone, don’t let the stoner tag throw you. Of course they love their weed and all but man can they jam. Big and burly fuzz soaked riffs rule their side of the split “Host”, plus Vincent Houde’s vocals are — simply put — vicious in an early Zoroaster sort of way. The tempo is a little quicker here than their usual doomy plod. But that’s not to say they’ve gone soft, not by a long shot. Rather it seems they’ve taken this opportunity to have a little fun and explore some acid drenched 70’s vibes. Nice ditty for a Saturday and we’ve still got one track to go. As good as Dopethrone opened this split, Fister closes it down with an iron fist and mercilessly rules it. Now, I realize this isn’t a competition and these two bands are just working together to give us, the listeners, the goods. But damn, “The Failure” rips your insides out and stomps a mud hole in them. And I mean that in the best of ways. This is right up there with the crushing weight of Primitive Man. The howls, screams, and growls from Marcus Newstead and Kenny Snarzyk are about as apocalyptic and despondent as it gets. The painfully slow riffs and bass heavy sludge going on in the background are thicker than quicksand. Fister have long been an entity that prides itself on brutal sludge and this track keeps their already busy momentum in full swing. If I had to pick one word to describe this track it would be — devastating. Last but not least is the ultra fitting horror and exploitative themed artwork from Alexandre Goulet. We’ve got a three paneled cover with a blood dripping knife protruding from an amp, a guitar neck jammed down a throat, and a hooded chainsaw wielding maniac terrorizing a young lady. If ever an albums artwork captures the raw intensity of its contents this would be the one. Not only does it fit well but the dark, ominous colors and abstract nature of its subjects are beautifully done. 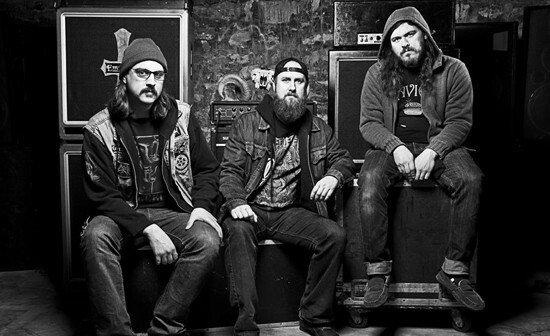 On this Split, Dopethrone takes a rare opportunity to have a little fun and Fister continues on its path of destruction. And we get to benefit from it. It truly is a great pairing and will no doubt be your Saturday fun time listening. So grab a cold one or whatever, hit the stream above, and let the rough side drag. After all, it is the weekend. Dopethrone / Fister Split is an independent release and is available now on Bandcamp. 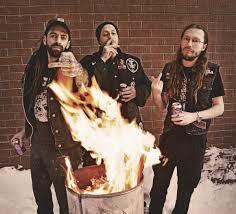 For more information on Dopethrone visit the band’s Facebook page. For more information on Fister visit the band’s Facebook page.